Supernatural went all Blair Witch Project on viewers with "Bitten," as the unusual episode focused on found footage and placed Dean and Sam in the background for a change. Found Footage Fail or Awesome Episode? Carissa: Tragically boring. I didn't care about the kids. They were arrogant and stupid. They even used the "I didn't ask for this" plea when each of them were begging to be next. Carla: About half way through the episode, I didn't care for it much. But, by the end, I really liked it. It was a tragic story. I missed seeing the guys in the episode and when they were seen it was awkward. But, overall, I'd say it was neither a fail or awesome. It was pretty good and a nice change of pace. Alice: I’m strangely in the minority that thought it was a completely awesome episode. I loved it. Sean: I liked that they tried the concept out, but really missed the focus on Sam and Dean. Maybe it would have been more entertaining for me if Dean had gotten a camera and wanted to mess around with it or something. Did you find the human to monster tragedy interesting or boring? Carla: It was a well-written story and definitely a tragedy. As I mentioned above, it didn't grab me right away, but by the end I was sucked into the story and characters. Alice: Very interesting. These kids were in college, contemplating their futures, and everything unraveled so fast. It’s tragic, and you have to wonder how many monsters Sam and Dean hunt have a similar story. They didn’t ask for this. Sean: I totally understood what the story was going for, but at times it felt forced. Certainly the outcome was tragic, but there were moments where it really lagged and I had to remind myself that I was watching Supernatural. Was episode four the right spot for this type of episode? Carissa: I don't think any time was the right time for this episode. The type of episode wasn't the point, it was the poor execution. The best thing about it was the ending credits. Carla: It was a good lead up to Halloween episode. These standalone stories pretty much can go anywhere in the schedule since they don't add to the overall arc or character development. Alice: No. 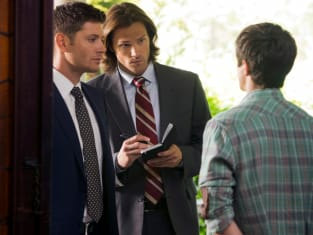 Considering episodes 1-3 have provided few answers as to what happened during the year Sam and Dean were separated, this episode would have been much better as a midseason break from the norm. Sean: I really think we needed more episodes involving the core story and watching Sam and Dean continue to grow before doing something essentially experimental was shown to us. It felt too soon, but I'm not sure if my overall thoughts would have changed had the episode been aired later. Were you surprised that Dean was okay in letting Kate go? Carissa: No. He was probably just as bored as we were and ready to get the hell out of dodge to find a case that was more exciting to pursue. Carla: After watching that video, it would have been heartless for him to go after her. She had a good soul as a human and there's no reason to think she'd go down a bad path now. She's seen the cost. There are greater foes for Dean and Sam to track down. Alice: No. He does, after all, have a new perspective about monsters, being among some of the worst during his time in Purgatory. I think he let her go though because of Benny. She deserves the same chance Benny is getting. Sean: It's really his new perspective and I was prepared for him to say so, especially with his "friendship" with Benny. Will we and/or should we see Kate in a future episode? Carissa: Please, I beg of all the demons, NO! Carla: I hope not, because if we do then she has failed at keeping what little of her humanity she has left. Alice: No, no, a thousand times no. It’s not that I didn’t like her, I did, but given the unhappiness of many fans over this episode TPTB would be crazy to go there again. But, hey, they brought Becky back, didn’t they? You never know what they’re thinking. Sean: We're pretty much in agreement that she shouldn't be back. Let her be one and done, much like this episode.